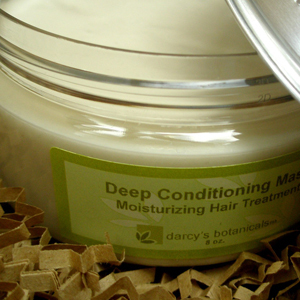 Our Deep Conditioning Mask will nourish, protect, strengthen, moisturize, detangle, soften and promote healthy hair growth! Can be used weekly or monthly to keep your natural coils looking radiant and beautiful. Use as a weekly or monthly deep conditioning treatment to help protect and nourish your natural curls. Distilled Water, Lavender Water, Vegetable Glycerin, Behentrimonium Methosulfate (and) Cetearyl Alcohol, Cocos Nucifera (Organic Virgin Coconut) Oil, Prunus Amygdalus Dulcis (Sweet Almond) Oil, Butyrospermum Parkii (Organic Shea Butter), Theobroma Cacao (Cocoa) Seed Butter, Sclerocarya Birrea (Marula) Seed Oil, Panthenol, Yarrow, Sage, Horsetail, Nettle & Lavender Extracts, Bentonite Clay, Hydrolyzed Oats, Cyamopsis Tetragonoloba (Guar) Gum, Phenoxyethanol, Caprylyl Glycol (a paraben-free preservative), Cananga Odorata (Ylang Ylang), Citrus Medica Limonum (Lemon) Peel Oil, Litsea Cubeba Essential Oil, and Organic Sea Kelp. Saturate throughout clean wet hair for healthy conditioning and moisture. Let it sit on hair for 20-30 minutes and rinse thoroughly. Use to deep condition, nourish and protect your natural coils, waves and locs.